Posted June 5, 2014 in Articles and Quetico Park People. The XY Company was a Canadian fur trade enterprise that was formed in 1797 by a group of men that were disenchanted with Simon McTavish’s leadership of the NorthWest Company. They were in direct and sometimes rabid competition with the NorthWest Company who labeled their packs NW; hence the new group called themselves by the two letters that come after W.
The NorthWest Company, Hudson Bay Company, American Fur Company and the XY Company all had posts and vied for trade in the boundary waters area. In 1802, Alexander Mackenzie gained control of the XY Company and when Simon McTavish died in 1804 the XY Company rejoined the NorthWest Company. Although it had a short life span, the XY Company was a relatively small and innovative company that had a big impact not only on this region but on the fur trade in North America. Currently, in Atikokan, there is a different XY Company. This company is still small and innovative, but it specializes in making canoe paddles. The paddles, made by the Don and Spencer Meany, are named after great Canadian explorers and voyageurs such as Alexander Mackenzie, Simon Fraser, William McGillivary, George Simpson, David Thompson and La Verendrye. They all paddled through Quetico and Don Meany says “it is our way of keeping an aspect of Canadian history alive”. Some remnants of the fur trade are still visible throughout the boundary waters. Where fur trade posts stood, there are now clearings that are slowly but surely reverting to forest. The site of a Hudson Bay post on the Canadian side of Basswood Lake is noticeably more grown over than it was when I first saw it twenty-five years ago and will be hard to find in another twenty-five years. Broken clay pipes and trade beads can still be seen at the ends of portages and on campsites along the voyageur routes. One of the founders of the XY Company is one of Canada’s most famous explorers. He paddled to both the Arctic Ocean and the Pacific Ocean. He became the first European to reach the Pacific coast north of Mexico traveling cross-country. When his crew reached the Pacific Ocean, he wrote on a rock in red ochre: “Alexander Mackenzie, from Canada, by land, the twenty second of July, one thousand seven hundred and ninety three.” Traveling primarily by canoe, he reached the Pacific twelve years earlier than Lewis and Clark. The early Europeans in North America adapted the canoes and paddles that were used by Native People. According to Kennicott, who traveled with voyageurs in 1849, the most common paddle was made of red cedar and had a blade about two feet long and three inches wide. Adney and Chapelle, in their book The Bark Canoes and Skin Boats of North America, stated that “no voyageur in his right mind would use a blade wider than between 4 1/2 and 5 inches wide, for anything wider would exhaust him in a short distance. …..The paddles were of hardwood, white or yellow birch or maple, as hardwood paddles could be made thin in the blade and small in the handle without loss of strength, whereas softwood paddles could not.” Interestingly, divers at Fort Charlotte on the Pigeon River recovered a badly eroded paddle from the bottom of the river that had a blade just 5 inches wide. Fort Charlotte, located at the west end of the Grand Portage, was abandoned at the end of voyageur period and the paddle is thought to be from the voyageur period. Paintings of voyageurs from the 1800’s, such as the well-known Canoe Manned by Voyageurs by Frances Hopkins, show long, narrow paddles that fit the descriptions found in journals. Today’s canoes are obviously not only smaller than the voyageur canoes, they are also designed differently. It wouldn’t make much sense to use a paddle that is a direct copy of a voyageur paddle to propel a contemporary narrow, 2-person canoe. However, the voyageurs preference for a light, durable paddle with a narrow blade, can also be successfully used now. The current XY Company makes a paddle that incorporates the voyageur design but has a recurved blade, a bent handle and is laminated. Two hundred years of evolution have altered the paddle, but not beyond recognition. 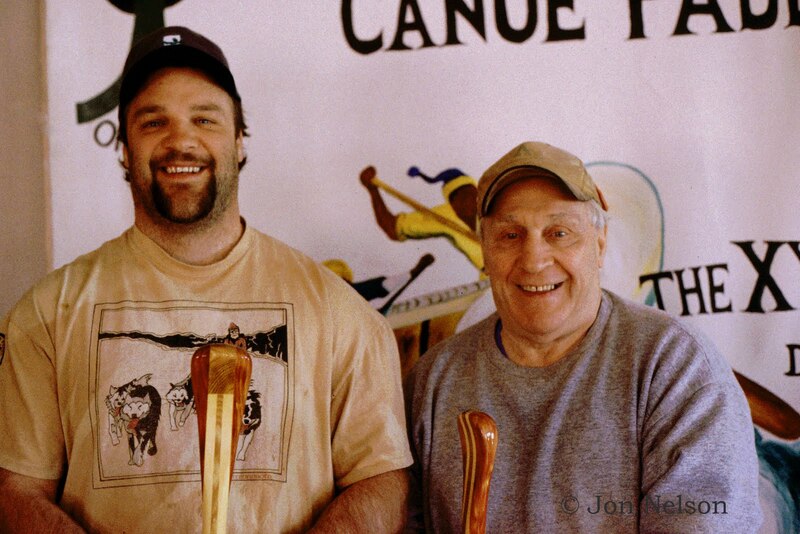 Don Meany started making paddles with his brother Joe in 1964 in the basement of the Rockton Hotel in Atikokan. Don began making paddles because he was active in canoe racing and thought he could make paddles that were better for racing than what was available. Both Don and Joe were very active and successful in many canoe races even though they were competing against the likes of Buzz Peterson, Gene Jensen and Ralph Sawyer. Don was a key member of the Ontario team that raced across Canada as part of the Canadian Centennial in 1967. The route, which covered 3,300 miles and took 104 days to cover, was from Rocky Mountain House in Alberta to Montreal in Quebec. It has been called the longest canoe race in history. This race was a way of paying homage on Canada’s one hundredth birthday to the explorers and fur traders who played such a crucial role in the opening up of the country. The 1960’s were a time of fierce competitions in canoe racing and many radical innovations were made in both canoe and paddle design. The changes made in canoe designs were subsequently adapted for recreational canoes and Gene Jensen, Ralph Sawyer and other racers were leaders in both making changes in racing canoes and bringing these changes to recreational canoes. The vast majority of canoes used today in the Boundary Waters are the result of adaptations that were originally made in order to improve canoe performance for racing. Major changes were also made in paddle design. These changes in canoes and paddles resulted in a modification of paddling techniques. The bent shaft paddle, the “hut” stroke, and an increase in tempo were all the result of canoe racing. 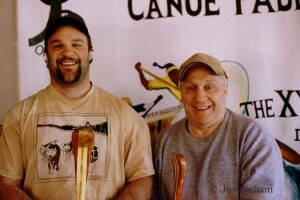 Two major innovations in canoe paddle design originated with Don Meany. He was the first to use the “recurved blade” on a canoe paddle. The blade is curved from side to side in a similar fashion to what is used in kayak paddles. He also experimented with spooned and cupped blades but found that they did not work well. Don also placed a bend at the top of the shaft so that the wrist is in a more natural position when paddling. That evolved from trying to keep the wrist straight and still have the paddle vertical in the water for as long as possible during each stroke. This is commonly done on bent shaft paddles but the XY Company also makes straight paddles with the bend at the top of the shaft. Almost twenty years ago, I bought a Meany paddle with the handle bent backwards at the top of the shaft. It was, and still is, so comfortable that I have continued to use paddles with this feature that looked so strange when I first saw it. In the early 1970’s, Don worked in Quetico Park and served as chief of the portage crew. This was prior to the can and bottle ban and portage crews were used to clean campsites as well as maintaining portages. He also participated in a full park survey of campsites in Quetico where the crew working for him were Junior Rangers – young men experiencing the park for the first time. It was Don’s philosophy to teach the crews as much about the park’s historical significance and the role it played in Canadian history as he could. I was told by people who worked with Don during this period that they vividly remember his stories around the campfire. He felt so strongly about emulating the voyageurs that he insisted that the food packs had a good supply of dried beans and jerky so that they could also eat like voyageurs. Don, known for his ability to carry heavy loads on portages, took part in a contest in Atikokan in the mid 1970’s to see who could carry the heaviest load for ninety feet. Don won by carrying 642 pounds. Don’s son, Spencer, grew up in Atikokan and canoed from an early age. He was an excellent hockey player and went to St. Lawrence University in New York on a hockey scholarship. He was drafted by the Buffalo Sabers in 1991 but decided to continue his college education and obtained a degree. He subsequently played pro hockey from 1994 until he was injured in 1998. He returned to Atikokan with his wife Samantha in 2000. He now works with his father and is a co-owner of XY Company. Since returning to Atikokan, Spencer has become interested in marathon canoe racing. He has purchased a Hassle racing canoe and is now starting to race. Spencer is also crafting his own style canoe paddles. He has inherited his father’s experimental nature and is currently working on a paddle with a refined design that weighs under one pound. His wife Samantha is an integral part of the company and uses a laser engraver to place designs on paddles. Meany paddles are now sold all over the world. They have filled orders from Malaysia, Serbia, France, Australia, England and a few African countries. The “Raid the North” adventure race held in Atikokan in June, which had competitors from many countries, was won by a team from France. The prize for one section of the race, which went from the Pines on Pickerel Lake to the beach on French Lake, was won by a team from southern Ontario. The French team was so impressed with the XY paddles that were given as prizes for this section of the race, that they had Don and Spencer make four more of the paddles and had them sent to France. Local historians and archaeologists do their best to make connections to people who lived on the land that is now the boundary waters of Ontario and Minnesota. These written connections to the past are usually not very successful in making the past seem vivid and alive. People who work with wood rather than words, such as the Meanys making paddles and Joe Seliga making canoes, are probably more successful in showing that the past can be materially expressed in a form that is still relevant and works effectively today. For more information about the XY Company, please visit their website. I have a Meany paddle and we visited Don at his shop several years ago. How interesting to get more insight into Don and his son, and their work.